Bible Reference: T he episode of Christ refusing gall, a sedative-painkiller is recorded in Matthew 27:32-40. When the Roman soldiers left the Praetorium with Jesus, they required him to carry the cross on which he would be crucified; however, Jesus was so weak from flogging and torture that he couldn’t carry it through the streets. The soldiers forced Simon of Cyrene to carry Jesus’s cross to Golgotha where the crucifixion occurred. At Golgotha, the soldiers offered Jesus wine mixed with gall. After tasting the drink, Jesus refused it. Then, the soldiers used nails to pound Jesus’ hands and feet into the cross. Jesus continued to wear the crown of thorns. By Roman law, the soldiers were required to write the charges against the accused at the top of the cross so that all who passed by would know the reason for the crucifixion. The inscription on Jesus’ cross was, “The King of the Jews.” The Roman soldiers positioned the cross up-right into a hole in the ground so that Jesus hung from the cross. Two thieves were being crucified at the same time as Jesus, one on each side of Jesus. Jesus was crucified at the third hour of the day, or about 9:00 a.m. When Roman soldiers felt pity for a prisoner before crucifixion, they added gall, or poppy juice, to the vinegar drink offered to prisoners. The opium poppy is a narcotic that induces a high level of deep sleep and pain relief. 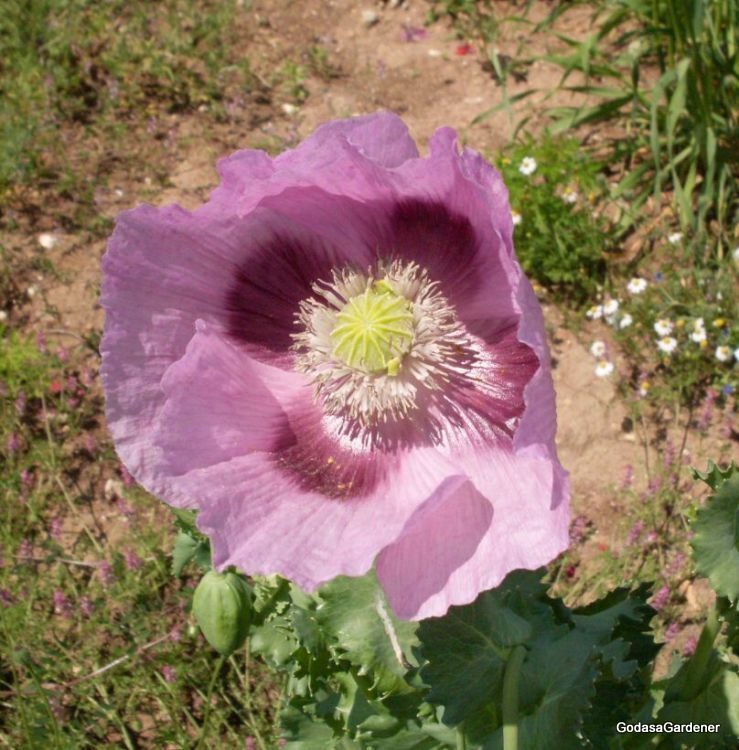 The common Western drugs morphine and codeine are distilled from the opium poppy. The gall in the wine offered to Jesus was most likely distilled from the Papaver somniferum plant, commonly called the opium poppy. Most books identify the opium poppy as a Far East plant; however, it was native to the Mediterranean region and eastward to Iran. In Israel, the opium poppy produces its beautiful flower in March and April. The opium poppy petal is a soft purple that looks rumpled, like an un-ironed cotton shirt. When the poppy capsule is harvested for its juice, a knife is used to cut transverse or vertical incisions in the unripe capsule. So valuable poppy juice is not lost or seeds damaged, harvesters take special care not to cut through the capsule wall. The white juice seeps through the cuts and hardens into brown masses on the outside capsule wall. These brown masses are scraped off the outer capsule wall, then combined in a clay pots or large trays and kneaded to a uniform consistency. This crude poppy is shaped into balls, cakes, or sticks for marketing. In the United States, it is illegal for home gardeners to grow opium poppies. This poppy produces opium, the ingredient in the gall offered to Jesus before his crucifixion. The drug would have sedated Jesus making him sleepy and reducing his pain. If a high concentration of opium was included in the gall, Jesus would have experienced hallucinations, further reducing his contact with reality. Jesus’ refused the sedative. He was determined to experience both the physical and mental pain associated with redeeming mankind. Reflection: Would it have made a difference to our redemption, if Christ drank the gall and was sedated on the cross? This entry was posted in Plants in Holy Week and tagged Bible Garden, Bible Plants, Bible Study, gall, God as a Gardener, Jesus, New Testament, Opium poppy, Papaver somniferum. Bookmark the permalink. Thanks fred pialeki. You speak truth. Helping me overcome an addiction. Thanks so much. This is a great summary to the writer of this page. Opium sedates and enslaves the higher conciousness. Jerry, it is important that Christians understand that CHrist was God and did not sin on earth. His tasting gall does not mean he ate or consumed sin. God knew many years ago humanity would have much affliction through many enslaving addictions. It is a plague which burdens the restless soul in the modern world. Jesus overcame and will overcome. Greater things you will do by His Spirit. Have faith, be of good courage as you remain steadfast to the end… Believe to see the Glory of God! Accepting the gall would have diluted not only Jesus’ pain, but it would have reduced the worth of the work He had done and what He was doing. It would have diluted our own salvation.